Want to buy the Deluxe Feel Bright Light? 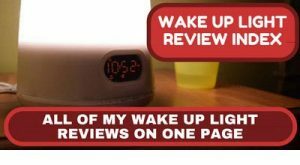 Note: All images used in this review have been kindly provided with the permission of Feel Bright Light. The Feel Bright Light is the world’s smallest light therapy device! It is small but powerful and ultra-convenient. If you decide you want to get the Deluxe Feel Bright Light, see where you can get the best price. 30-day risk-free, no questions asked return policy. 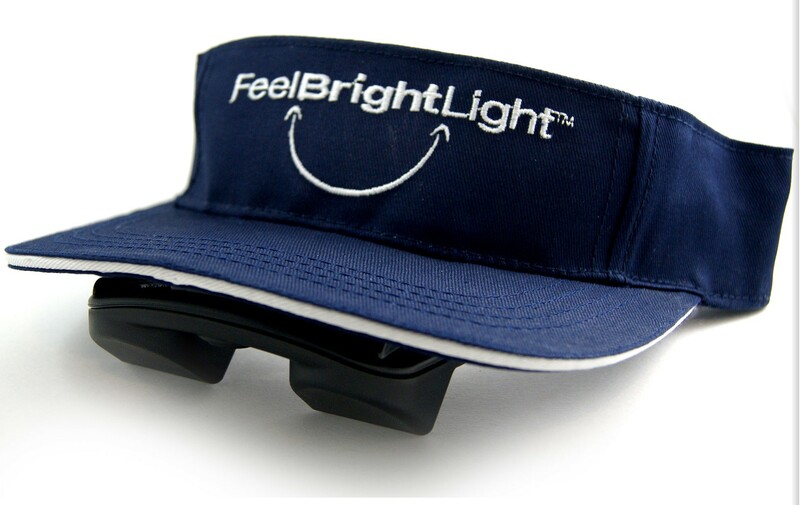 The Feel Bright Light Deluxe is another rare breed in terms of SAD lights and is as probably about as portable as you can get – it literally is a visor/baseball cap with the light pointed from the peak of the cap/visor into your eyes. This obviously means it is completely hands free, so you can enjoy your light therapy on the go. Using it is quite straight forward, you can either use the enclosed visor that comes with it or choose your own hat or visor to wear as it comes with a mounting kit. The batteries are rechargeable so make sure they are fully charged. Press the on/off switch once to use it at 12,000 lux and once again for 8,000 lux. 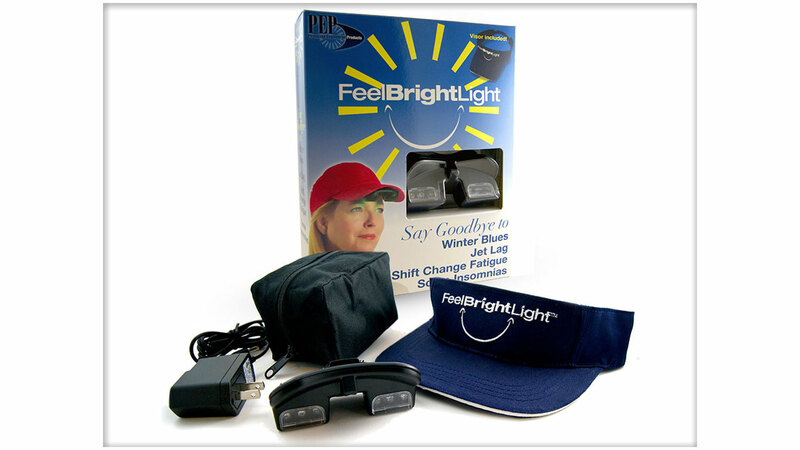 The Deluxe Feel Bright Light comes with a visor, charger and carry case Put the hat on and adjust the brim so the lights shine directly into your eyes – the lights should appear brightly in the upper portion of your visual field and you should be able to look out from under the brim of the hat in the normal manner. Note that you do need adequate background or room lighting on when you use this, otherwise you may find yourself walking round bumping into things. The light uses what Feel Bright call Greensafe Technology – this utilizes wavelengths of light along the visible blue-green spectrum that is between 470-560nm – peaking at 525 and is completely UV free. The device uses LED bulbs that are manufactured to last 30,000 hours (or 329 years if you use it for 30 minutes per day for 6 months!). The lights shut off automatically after 30 minutes of use. Your best bet in terms of charging it is to leave it on charge after each session to ensure it is fully charged for the next day. Note that you are instructed not to drive a vehicle when you use the Feel Bright Light. 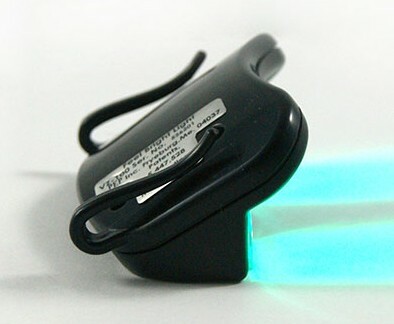 The Deluxe Feel Bright Light in the world’s smallest light therapy device, weighing in at only 2 ounces and one of very few wearable light therapy devices. Obviously the size means this is one of the most portable light therapy devices on the market. You can use it as you walk around (make sure the lights are on otherwise you will bump into things! ), use it as you read, chat, watch TV, even as you exercise. 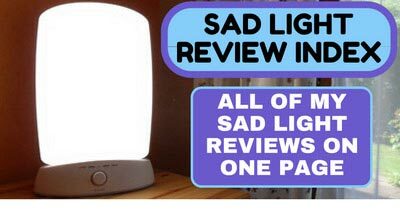 This means it is so easy to incorporate this SAD light into your daily routine. If you are pressed for time and don’t want to wake up 30 minutes early to get your dose of light therapy all you have to do is buy this and you can wear it and get your dose of light therapy whilst you get ready for work. Whilst this is small, it is certainly powerful. Most desktop units emit 10,000 lux of light – this emits up to 12,000 lux. It is also handy that you can adjust the light intensity between the low setting of 8,000 lux and the high setting of 12,000 lux. It also has an automatic shut off feature which turns the light off after 30 minutes, which is useful, and is obviously rechargeable! This device really isn’t for the self-conscious! Whilst it is portable, if you are easily embarrassed you might not want to wear it in public or at work as it does look odd. Also the greenish light does make it difficult to see whilst you are using it indoors. Whilst the batteries are manufactured to last 30,000 hours, a common complaint is that after a couple of years they do begin to run down and get dimmer and lose the ability to fully charge and need replacing. However if you contact the manufacturer he is very helpful and will replace them for around $15. A slight annoyance is that when the charger is plugged in there is no way of telling if it is on as it does not have a light on it – you have to physically pop out the visor and turn on the light. It would not take a lot for the charger to have a light on it to show this. The Deluxe Feel Bright is not particularly well made. It is top heavy and sometimes slips down in front of your eyes unless you have it very well fastened. 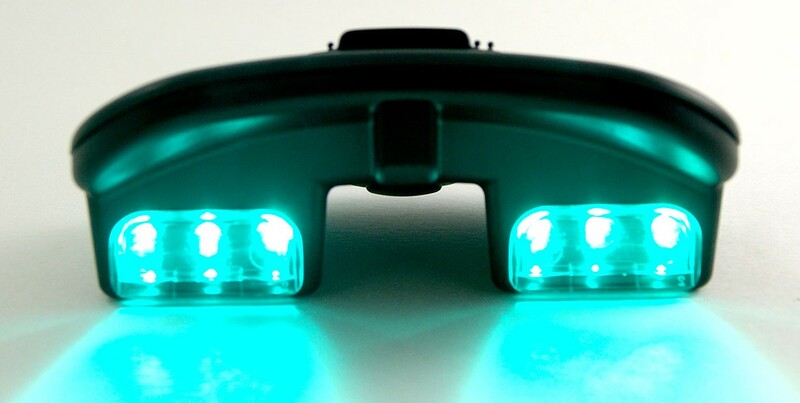 Several users complain that the light visor is poorly made and often needs replacing or suddenly stops taking a charge and that the Velcro does not work properly. Linked in to this then the price point is rather high for what feels like a slightly cheaply made product. Note that you can buy the light unit and charger separately, without the visor for around $40 cheaper, which you may think is a better deal. It is difficult to judge the design of this, as it is pretty straightforward, a visor and light unit! However as I mentioned before it does appear slightly cheaply made and isn’t for you if you are the self-conscious type, so in that respect it gets the thumbs down. It does have lots of good feedback. 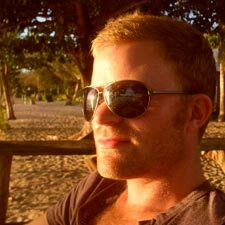 One user said that it had completely banished their need for a variety of anti-depressants they had been on such as Prozac and Wellbutrin, etc. Another called it the best purchase of their life and said that after 15 years suffering with SAD they were finally feeling great again and had more energy now then they had had in 20 years. This is quite an ingenious design and if you are pushed for time or don’t like the idea of sitting around in front of a light box then it will be the perfect option for you. For such a small device it packs a powerful punch and is probably as convenient a SAD Light as you will ever find. However it does seem quite cheaply made and considering this it is expensive. But you can always buy the light unit and charger separately and at a cheaper price which is also worth considering. As mentioned above this is really in its own field when it comes to SAD Lights, I haven’t reviewed anything similar yet, so the only alternative is the standard Feel Bright Light, which is just the light unit and charger without the visor etc, but more cheaply priced. Laura lives in the beautiful wilderness of Canada – which mean some stunning scenes from Spring to Autumn, but some very dark winters. She has suffered from SAD since her teens, but has it under control thanks to her collection of SAD Lights! I have never heard of anything like this! Why don’t doctor’s mention this kind of stuff. I’m so skeptical and hesitant to take new medications. I’m on two right now, and though everything seems to be working, I hate the fact that my body is building up tolerance to these drugs. 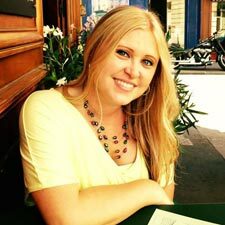 I would love to try something like this for my mood disorder… I will bring it up with the doc when I see her again! 🙂 Thanks!! You are most welcome! I am amazed that they aren’t better promoted – they are clinically proven to work. Speak to your doc and see what she says and if you need anymore advice on what might be the best SAD Light for you just drop me a line!